1. Red Sulphur Springs, Monroe County, W. Va.
Red Sulphur Springs, Monroe County, W. Va.
A view of Red Sulphur Springs showing the overhead bridge. 2. Red Sulphur Springs, Monroe County, W. Va.
A distant view of the ruins of Red Sulphur Springs. 3. Red Sulphur Springs, Monroe County, W. Va.
A view of the Red Sulphur Springs ruins looking down the valley toward Indian Creek. 4. 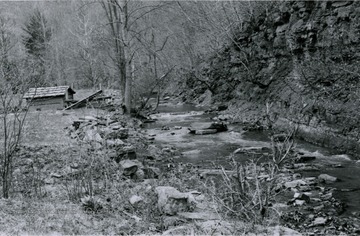 Red Sulphur Springs, Monroe County, W. Va.
5. 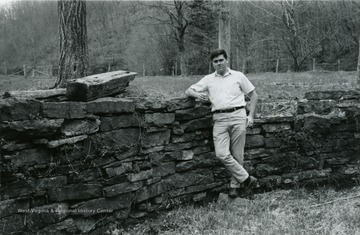 Unidentified Man Leaning on Stone Wall at Red Sulphur Springs, Monroe County, W. Va. 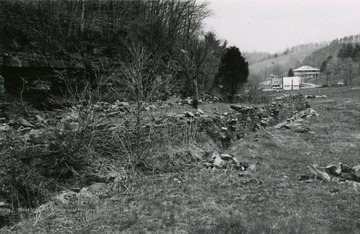 Unidentified Man Leaning on Stone Wall at Red Sulphur Springs, Monroe County, W. Va.
6. Wooden Steps off a Stone Wall at Red Sulphur Springs, Monroe County, W. Va. 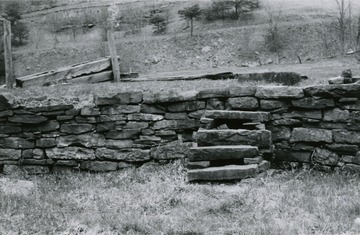 Wooden Steps off a Stone Wall at Red Sulphur Springs, Monroe County, W. Va.
7. 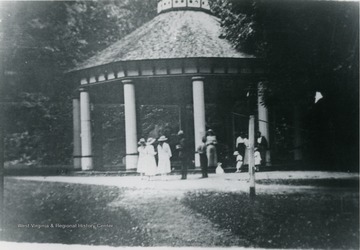 Visitors at Red Sulphur Springs, Monroe County, W. Va. 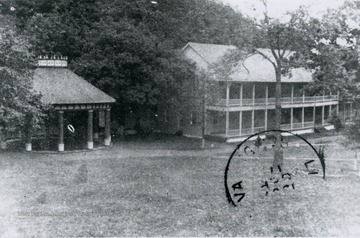 Visitors at Red Sulphur Springs, Monroe County, W. Va.
8. Spring and Accomodation Building at Red Sulphur Springs, Monroe County, W. Va.
Spring and Accomodation Building at Red Sulphur Springs, Monroe County, W. Va.
9. 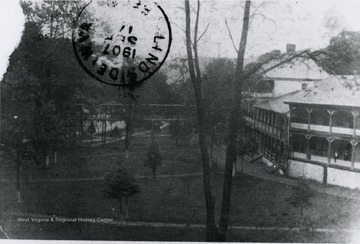 Partial View of the Lawn at Red Sulphur Springs, Monroe County, W. Va. 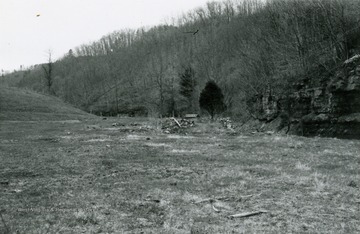 Partial View of the Lawn at Red Sulphur Springs, Monroe County, W. Va.
10. 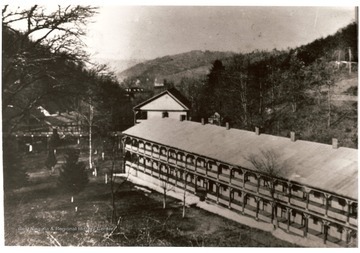 Hotel at Red Sulphur Springs, Monroe County, W. VA.
Hotel at Red Sulphur Springs, Monroe County, W. VA.
Red Sulphur, a resort located in Southern Monroe County, W. Va. 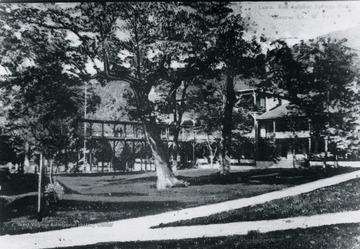 It was a popular mineral spring resort from 1820 to World War I. 11. 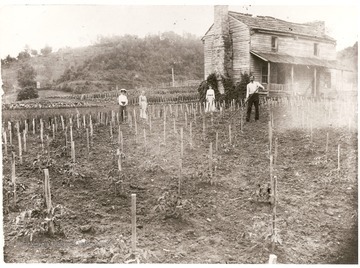 Farm Near Red Sulphur Springs, Monroe County, W. Va.
Farm Near Red Sulphur Springs, Monroe County, W. Va.
12. 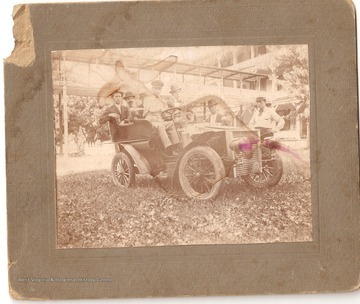 Staff and Guests in a Touring Car at Red Sulphur Springs, Monroe County, W. Va.
Staff and Guests in a Touring Car at Red Sulphur Springs, Monroe County, W. Va.
"First car to come to Red Sulphur. The two men standing are J.C. Miller with dark hat on. Bud Dunn with straw hat, Dr. Will Huseter driver of car. Do not know rest. 1906"